We provide specialized treatments for PTSD, Panic Disorder, Social Anxiety, OCD and Generalized Anxiety Disorder. 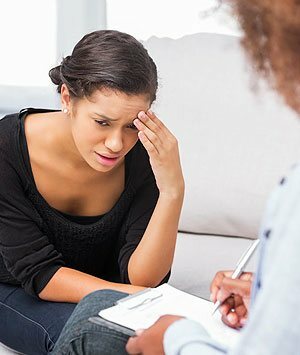 We offer CBT treatments for anxiety disorders including Generalized Anxiety Disorder, Simple and Social Phobias, Obsessive Compulsive Disorder, Panic Disorder, as well as non-specific anxiety disorders. Through treatment individuals learn to recognize the relationship between their thoughts, Behaviors, and their anxiety. Based on this examination, individuals learn to modify thoughts and behaviors in order to shut down and eventually prevent anxious reactions. Treatment can be delivered individually or in a group setting and most people experience significant improvement in 12-16 sessions. Sessions typically lasting 55 minutes can be delivered on a once or twice per week basis. We offer treatment of Posttraumatic Stress Disorder (PTSD) through specialized PTSD treatments, such as Cognitive Processing Therapy (CPT) and Prolonged Exposure Therapy (PE), as well as through more generalized Behavior Therapy. PTSD treatment generally involves education on trauma (i.e. military combat, abuse, sexual assault, natural disasters, etc.) and trauma reactions, exploration and processing of the impact of trauma on thoughts, feelings, and behaviors, and skill building to learn strategies to manage and even eliminate triggers that typically lead to anxious mental, emotional, and physical reactions. Treating PTSD often results in: increased comfort in public/social situations, increased feelings of control, improved ability to trust, improved mood and increased feelings of enjoyment, as well as improvement in relationships with friends and family. Treatment can be delivered individually or in a group setting and most people experience significant improvement in 12-16 sessions. Sessions typically last 60 to 90-minutes can be delivered on a once or twice a week basis.